The High Court’s use of the Care Act to quash Merton’s decision to transfer a service user (JF) to a cheaper service has raised hopes the act might yet deliver on the promise to lead social care away from being rooted in a resource led view of need to one authentically person centred. The judgment may indeed prove to be such a watershed moment. However, caution must be exercised – the greater chance is that it will not. Public law solicitor Alex Rook will be providing an update on Care Act case law at this year’s Community Care Live London. Register now for your free place at the event, on 26-27 September, to get up to speed with what the act means for your practice. At the heart of the judgment was the court could find no evidence of who actually made the decision to move JF’s placement, when, within what policy or upon what evidence of need. The social worker told the court that the ‘funding panel’ makes such decisions, always ensuring that the choice will meet the person’s needs. However, glib assurances were not enough for this judge. She searched for evidence that the decision maker (whoever that was) satisfied him or herself that the cheaper service would meet JF’s needs. The search was in vain. All Merton could provide was a statement from the provider of the cheaper placement that they could meet JF’s needs. Merton trusted this implicitly, as if commercial interests played no part. Meanwhile JF’s view (advocated by his parents) was that the current, more expensive placement was necessary. The higher price paid for a range of on-site therapeutic services that were key to his well-being. These would not be available in the cheaper placement. Such thinking actually satisfies the Care Act requirement to demonstrably link need, well-being and resource. Merton put this plainly superior view in the box marked ‘service user’s preference’ – something to record, but not allow to influence their thinking. So Merton have been well and truly called out by this judgment. But celebration would be premature. The judge made very clear it is not for courts to change decisions made by a ‘public body to whom parliament has entrusted the decision making’. Courts can, however, require those bodies to follow any processes laid down by Parliament to making such decision. This was where Merton failed. 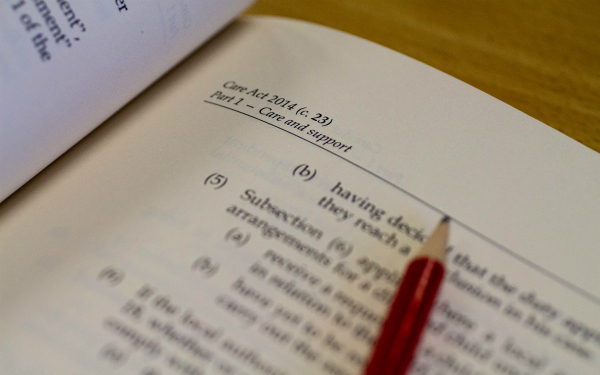 The Care Act requires that decisions about resources are based on an assessment of needs to promote well-being. They have been told to revisit the assessment and do it lawfully. How will they set about this, and what lessons will all other councils learn from this judgment? Merton have three options. The first is to learn from a recent case involving Oxfordshire council. Courts set a very low bar for credibility when councils claim that their decisions are based on needs not resources. If deciding ‘need’ based on resources was a crime, any jury would almost certainly have found Oxfordshire guilty beyond any reasonable doubt in the case of Luke Davey. The thinnest of rationalisations will suffice. However, one crucial ‘rule’ of this game is the social worker must fully claim the thinking to be theirs and theirs alone. This appears to satisfy courts the assessment is about need, not resources. The real decision makers must remain anonymous and hidden. The second option is to accept that JF’s own view is the more Care Act compliant view, use it as the basis for the council’s view and then fund the more expensive placement. The problem is that if Merton have decided the higher cost is unaffordable, where will the money come from? Within a fixed budget, this means the higher cost will be borne by lower allocations of resource to other service users. Is that fair? The third option is again to accept JF’s view, but, if the more expensive placement really is unaffordable, to fund only the less expensive placement. This will be on the basis the cheaper service will be able to meet those parts of his assessed needs the council places itself under a duty to meet. It can do this if it restricts such needs to a safety net only. Those parts of his assessed needs that require the expensive placement will not be met. JF will experience raised levels of distress almost certainly resulting in more challenging behaviours. It would be very much second best. JF and his parents would of course prefer the second option. It might well be Merton’s most pragmatic option having made such a hash of the case to date. It would follow in the rather dishonourable tradition familiar to practitioners of those with the strength to contest having the greatest reward. But the option that would really signal this case as a watershed moment would be the third. The council would not be in a dispiriting and costly dispute with JF and his parents about what JF’s needs are. This would extend to the myriad of others who do not have the tenacity to pursue a judicial process and about whom we know nothing. The council’s officers would cease to contort the assessment process to give their political leaders the comfort that all needs are being met. The reason for JF’s suffering would be perfectly clear to all – lack of resources. A better option was available, but unaffordable. This excellent judgment made clear it is not for the judiciary to right the wrongs of a system that is politically driven. That remains a matter properly for political leaders. This will require sector leaders to start telling them like it is. 10 Responses to A watershed moment for the Care Act? Colin, I’m afraid you have fallen head first into the trap that most commentators will fall into, casting Merton (and other Local Authorities) as the “bad guys” in this narrative. Merton are being forced to act in this way because their budgets have been eviscerated by Central Government, but that is not mentioned, even once, in your commentary. It’s very easy to take glib pot shots at Local Authorities who are trying to manage ever shrinking budgets. It’s much more difficult to come up with solutions that are Care Act compliant, meet Service User expectations and offer the savings that need to be drawn out of Social Care budgets. More constructive comments would be welcomed by all. Jason – the issue is not the gap between needs and resources, nor whether it is increasing or reducing. The issue is how councils respond to the gap. Colin I agree with your statements although I have also have some sympathy for LA’s who are trying to implement the SDS Act in Scotland – in a landscape of ever shrinking resources be it Providers and or budgets. However as you say it is the RESPONSE to the above challenges which is key I believe we (social work) need to become more innovative, creative and transparent about how we allocate scant resources. SW should advocate for and empower individuals to seek real change, – focusing on outcomes as a starting point, whilst promoting each individuals basic human rights. I very much agree with you Rosie – social work has to find the most creative and effective use of limited resources. But to do that on a consistent basis, I believe you must be freed up in your practice, which will require losing the burden of having to ensure that there is never any unmet need at the end of the process. There can be no assumption that even the best, most cost effective practice for every single case will result in the demand upon public resources coming within the budget if the aim is for all to have a reasonable quality of life. I think this is excellent piece by Colin. If i understand him correctly, the response that would have integrity would be to complete an assessment of need and consider resources after. If budgets cannot meet the need due to limited resources and alternatives are required, and if this impacts on a person’s well being as a result, be honest and acknowledge it. In this way a political debate may ensue. I recall when I was a student on placement a social worker was told by an accountant(!) to amend her assessment as she had reflected an unmet need within it. The social worker turned a shade if crimson and refused. Never forgotten that! I agree with Jason. We are in a situation where it is totally impossible to meet needs and promote wellbeing- the funds are simply not there. You can’t close a gap with thin air. The social care precept barely contributed to the gap and IBCF is only a temporary fix. Hannah – of course it is the case that sufficient resource is required to meet all needs for well-being. But the answer, when that is not the case, cannot be to allow your assessment of need to be so compromised that all the needs that cannot be met are vanished. I share your wish to see sufficiency of resource, but we need a process that pulls the democratic process in that direction, not one that lets it off the hook. Thanks for the blog, Colin. I see Jason’s point, that we have to make the point that implementation of the Care Act is not affordable with Central Govt cuts to Local Authority budgets. But I think the mechanism for doing this is to highlight the gaps between needs and services. I have been researching integrated assessment of needs for older people. I think it’s important that real needs are assessed and reported – ideally this should feed into the Joint Strategic Needs Assessment of the population, and in turn the Health and Wellbeing plan/strategy should identify the need for an increase in funding of budgets/services. Unfortunately this is many years of bureaucracy, during which time people are missing important services or support… but it does at least bring it into public debate. I’m not surprised the court quashed the decision. It was quite telling that the court could not find evidence of who the decision maker was and a lack of evidence of need. Social workers are expected to undertake evidence based practice within their work. This practice appears to have bypassed the ‘funding panel’ and the court rightly corrected this in my view. I think this is an insightful examination of the current situation that LAs find themselves in currently and through no fault of their own. Except that I wish they would tell the government a bit more loudly how they are destroying local communities in England. I think it was Luke Clements who said that the Care Act was a good piece of legislation but it was like rearranging deckchairs on the deck of the Titanic if the funding wasn’t there to implement it. Wise words which have become so true.